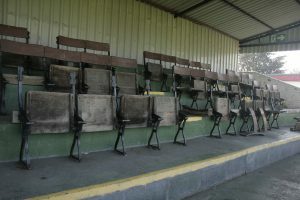 I have just managed to source a small number of Stoke City’s former Victoria Ground seats from Whitchurch Alport FC, so after thinking it was all over, I am able to put another 30 together. I have quite a few pre-ordered so they probably won’t be around very long. Here they are at Whitchurch, where they have been since their removal from the Victoria Ground. As you can see below there is quite a difference between the parts as they came from the Boothen Stand and the finished, fully restored seats, assembled in pairs on an oak base with an extra back rail to make them more sturdy. Using our medium stain and a tough durable polyurethane finish, they have a silky smooth finish and a satin sheen that deeply enhances the beauty of the grain. 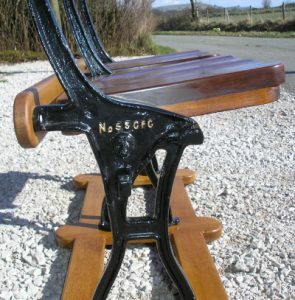 Most of the backs were made from beech which was an excellent timber for steam bending. The seats were made of mahogany for durability and have sanded up almost like new. 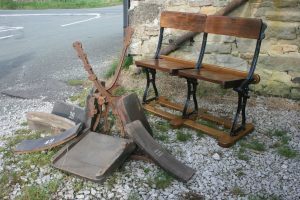 I have tried to retain some of the wear and knocks to give some idea of their former life in the stands. Casting number highlighted in gold. One of the key features is the casting number on the right side of each cast iron end, which I highlight in gold. 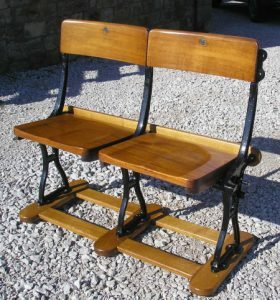 A pair of fully restored seats. They can be used outdoors but prefer not to be left out in the worst of the weather and will deteriorate in prolonged outdoor conditions. A perfect place for them is in a hallway, beside the phone as the seats can be folded vertical when not in use. Many people or groups have purchased sets for presents to leaving or retiring work colleagues. Delivery can be arranged if necessary. I even sent two pairs to Houston, Texas , although carriage proves rather costly! 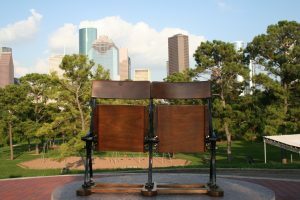 Ex-pat Stoke fan Neil Chapman had a pair of seats sent to his home in Houston, which is seen here against a futuristic Houston skyline. He must be a very loyal fan, having attended 8 home games in 2010. That’s a fair round trip! A pair of seats stand 34” high x 39” long x 17” deep. If you are interested call me or email to arrange to view them or call in at our showroom, Longnor Craft Centre and Coffee Shop, now open every day until Christmas, 10am to 5pm. I normally have a few sets built up but its safest to call me if you would like to look at some. PS. It is pure coincidence that my name is Peter Fox, same as the long time Stoke goalkeeper.